"Relativistic quantum chemistry with reduced-density-matrices: The effect of angular momentum constraints"
Ab initio methods are a class of computational models that can be used to predict the properties of chemical systems without any experimental data. One challenge is to develop low scaling yet accurate methods that can be applied to large systems. To reduce the computational scaling, we take an unconventional approach and use reduced-density-matrices (RDMs) as the central variables, as opposed to the N-electron wave function. The RDMs must satisfy so-called N-representability constraints to guarantee that they are derivable from an antisymmetrized wave function; one can impose such constraints and variational optimize the RDMs using semi-definite programming techniques. Another challenge in ab initio theory development is that, depending on the chemical systems of interest, the physics included in the model must be approximated in different ways. For example, to correctly describe the chemical systems containing heavy elements, one must account for spin-free relativistic effects and spin-orbit coupling. 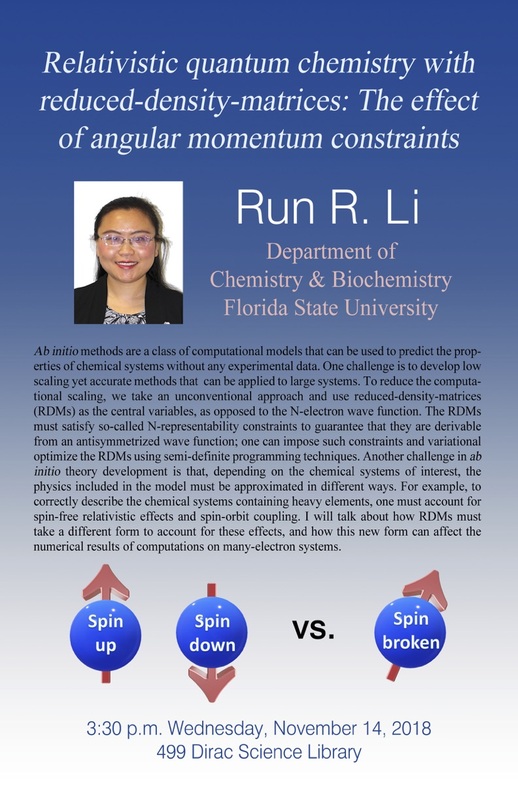 I will talk about how RDMs must take a different form to account for these effects, and how this new form can affect the numerical results of computations on many-electron systems.